I’m not just about new lamps and throw pillows. Oh, no. I fix toilets too. Our downstairs toilet was “ghost flushing.” Basically, the flapper wasn’t closing all the way. Water would leak out of the toilet slowly, until the float level was too low and then the toilet will fill itself up again. This was happening about every hour, wasting a lot of water. So off to Home Depot I went, to search for a solution. Much to my delight I found something that would not only get rid of my ghost, but would help us save water too. 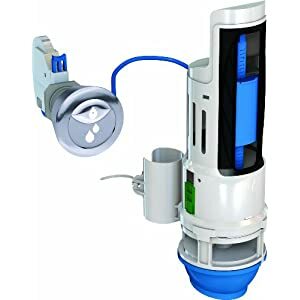 The HydroRight dual flush toilet converter. Now, the box says “Install in 10 Minutes.” I must admit it took me closer to 20, but the first 10 were spent figuring out how to get the old flush handle off. But if the claim “saves $105 a year” is true, even 20 minutes was totally worthwhile. First, thank you for posting the Ghostbuster’s Theme Video/Song. Awesome. Next, I have also installed a HydroRight into my toilet and couldn’t be happier. With 2 kids, water wasted is also money wasted. It feels good to save water and also teach the young ones to be environmentally friendly. Have you also looked at the HydroClean fill valve? We replaced the old “Ball” float valve with the HydroClean and yes, the tank is much cleaner! Oh, you are so good! Our toilet is still not flushing right and we haven’t taken the time to figure out what’s wrong with it, or how we can fix it, but this is motivating me (well really, motivating me to motivate Jer!) to fix it ourselves and soon! And what an awesome dual flush converter thing. I’ll have to check that out too! What a great way to save water!